Carefully peel the ginger and cut into thin strips. 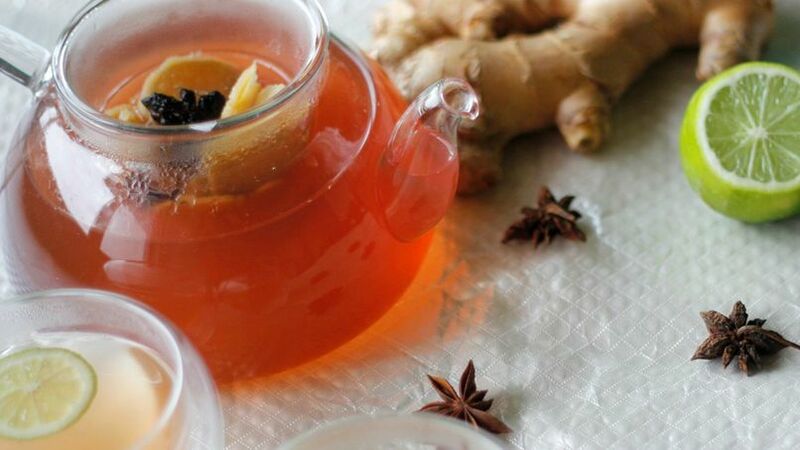 Pour 4 cups of water into a pot, add the ginger, star of anise and cook over high heat. Lower heat once it begins to boil and let boil softly for five minutes. Turn off the heat, cover the pot and let sit for 15 minutes. Add the lemon juice. Serve and sweeten each cup with honey to taste. You can find the star of anise in the Latin products and spices section of your supermarket. If it's a little strong, you can add one more cup of water or reduce the amount of ginger. The taste is really a question of preference. Ginger and anise are two flavors that are forever linked to beautiful memories in my life. My grandmother loved anise; she always had these little hard candies in her kitchen that she gave me when I went to visit her. Her anise gelatins were known throughout the city and of course I was always first in line to eat one… or two! I began using ginger about 13 years ago. My husband loves its smell and taste; I know he'll happily eat any dish made with this aromatic root. And my kids can't stop eating gingerbread cookies when we have them in the house. These two flavors are a little strong, but I think they compliment each other very well. The idea of a hot tea was appetizing to me because of the cold winter days that many of us are still experiencing. Its taste is strong and a little spicy but it goes well with a bit of lemon and honey. Enjoy!